Looking back through this blog, I am reminded that in 2012 I attended a SCoPE seminar on digital badges and wrote two posts about it. Reading back through these posts I see that at that time I had some reservations about badges. • Will badges promote quality learning or will they simply encourage people to ‘jump through hoops’? • Will badges be ‘recognised/valued’ by employers – will they need to be? • Will badges stifle creativity and emergent learning? In the second post – SCoPE Seminar: Digital Badges Implementation – I reflected on the credibility of these badges, their value, their integrity, their status, what and who they represent. I wondered whether the badge system would promote the ‘completion of tasks’ approach to learning, more than a focus on developing a depth of understanding. And the discussion of the design and implementation of badge systems made me wonder whether this could ultimately disempower learners rather than empower them. It will be interesting to see whether this week’s discussion in the E-Learning 3.0 MOOC, on how the distributed web can change the way in which learning success is recognised, will answer the questions and concerns I had back in 2012. – award it to yourself. – place the badge on the blog post. Before I started on this task I found that I had already been awarded a badge by Matthias Melcher for completing the task he set for participants earlier in the course. He posted this task on his blog – el30 Graph Task – and I describe how I completed his task in this post. Matthias’s award was a great help, as it functioned like an advance organizer enabling me to know what I could expect to see and what I should look out for. Here is the badge I received by email from Matthias via Badgr. I really like the design of the badge. Clicking on download (as in the image above) took me straight to the Badgr site, which was used to create this badge, and by following Stephen Downes’ instructions, which he outlines in this post it was quite straightforward to create an account and award myself a badge. I now have two badges in my Backpack. Clicking on a badge provides details of the evidence for the award, including links to the sites where the evidence is held. See image below. Finally I created an E-Learning 3.0 badge collection. Using Badgr is a straightforward and quick way to create badges, but it does seem critically important to ensure that the evidence of achievement is comprehensive and that the evidence boxes are completed. 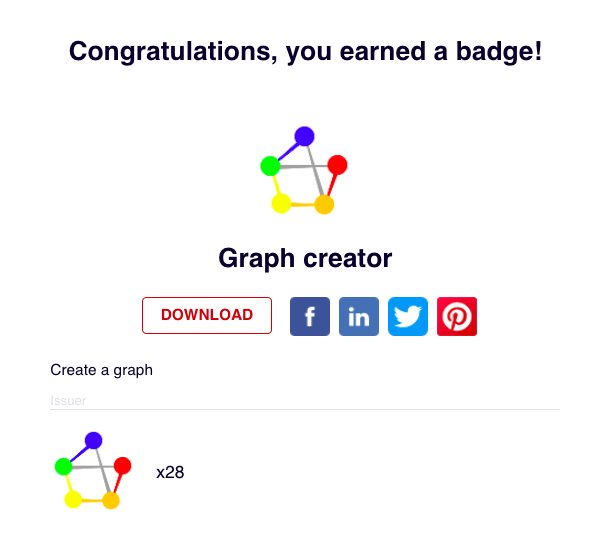 The question that I hope will be discussed in this week of the E-Learning 3.0 MOOC, is whether and why digital badges are the way to go in terms of recognising success in learning on the distributed web. Free tools to issue Mozilla Open Badges. 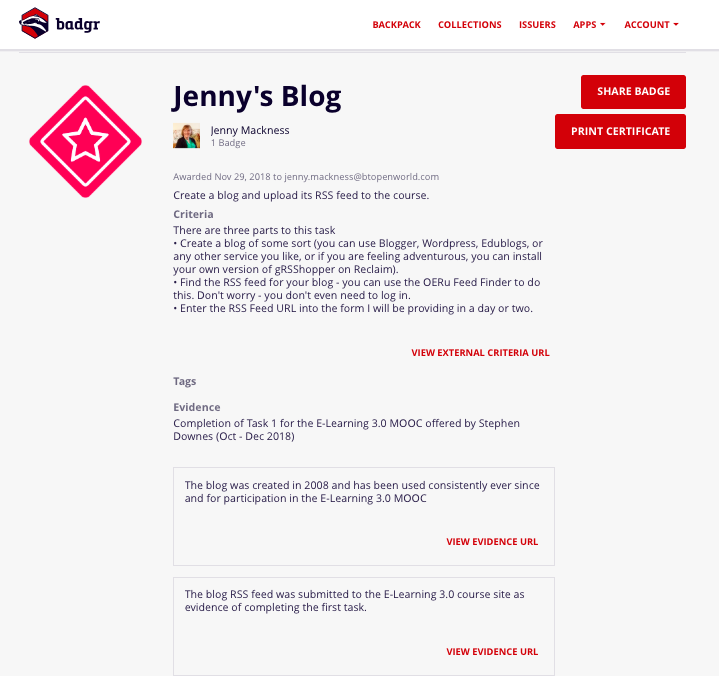 Design and award your own open badges: credential skills, recognize learning and create bite-sized rewards to support micro-credentials in your eportfolio. General information page about badges. “Open Badges are verifiable, portable digital badges with embedded metadata about skills and achievements. They comply with the Open Badges Specification and are shareable across the web. Each Open Badge is associated with an image and information about the badge, its recipient, the issuer, and any supporting evidence. All this information may be packaged within a badge image file that can be displayed via online CVs and social networks.” See also the IMS Open Badges specification. Application for creating digital badges. Badgr is open source software based on open standards. Here’s the community website. Here’s a sample of me creating and awarding myself a badge on Badgr. What if teachers learned to perform to transform rather than be a guide by the side or a sage on the stage? Teachers perhaps need to be an equal part performer who enact and ‘live’ the subject in their interactions with students.